Gegenstand des Auftrags: Das ÖBH beabsichtigt das derzeit eingeführte digitale EUROCOM Vermittlungssystem und das parallel dazu betriebene Datennetzwerk durch ein militärisches IP basierendes IKT-System zu ersetzen, in welchem das Sprachservice als ein integraler Bestandteil inklusive der sonstigen laufenden Dienste und Services des Datennetzwerkes anzusehen ist. The purpose of this architectural view is to establish the IP-suite as the main vehicle for communication interoperability, ie as the protocol that allows routing and addressing in the network of networks. By using the IP-suite to integrate all nets, a number of advantages can be achieved such as platform and operating system independence, easy integration with a large number of transport and application protocols, and access to many commercially available gateways to dedicated military nets. The use of the IP as the convergence protocol is shown in Figure 5-5 above where the possible relations with other networks are shown. The gateways are used for communication between non-IP applications and the IP-convergence layer is, while tunnels are used IP-communication through other networks. It is a matter of choice, how much the IP-addressing will be used in the dedicated networks, at least in the initial phase. The advantages of using IP as the overarching protocol are many. Most important is its wide use and acceptance, which means that most vendors either use it as a native network protocol or support it, so that interfaces to the IP-network are easy and relatively cheap to establish. The interface may be gateways or tunnel solutions. The dominating position of the IP (including IPv6) will last for the next 15 years. The IP (both IPv4 and IPv6) is a connectionless protocol, a best-effort protocol. The IP thus does not guarantee that its protocol data units, the packets, arrive at their destination. Damaged packets are discarded. Error control such as retransmissions must be done by other protocol layers, such as the transport layer protocol TCP. The IP has other limitations such as a very limited range of Quality of Service (QoS) parameters. There is a lack of real-time performance. This means that for a number of communication tasks, the IP will be insufficient, and more dedicated networks such as tactical datalinks (TDLs) must be used also in the future for a long period of time. The IP has otherwise proven itself to be a robust and versatile protocol. It is also possible to consider the total networks of networks in another way. The figure above shows that the network of networks consists of dedicated networks, and networks that use the IP as their native protocol. In some cases end-to-end communication is achieved by use of gateways and different access networks, in other cases the communication devices use only the IP. The TDR operates on either 12V or 24V allowing easy installation into any military or civilian vehicle. 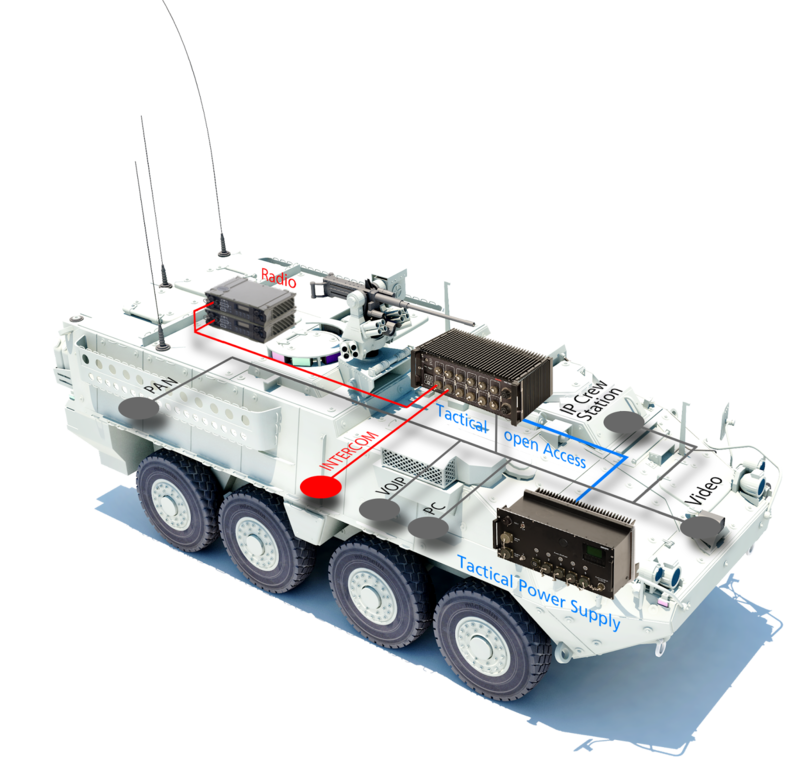 The small footprint provides a complete tactical internet solution in vehicles where space and weight allocation is limited. Telefunken RACOMS told MONS that its won several millions in Sweden with its MCTR family of software defined radios, which has also been offered to the Austrian Army, whom they have supplied tactical comms in the past. Also, the company supplied PNR-1000s to the Netherlands. Vermutlich geht es dabei um den Datenfunk für das FTCN. Häupl: "Meine Welt ist im Museum anzuschauen"
In der Favoritener Starhemberg- Kaserne ging es Dienstag um 115 Millionen Euro für das Fernmeldenetz des Heeres. Auch ein wichtiges Thema: Gegen die Gefahr durch Drohnen und Cyber- Angriffen rüsten sich die Soldaten der Führungsunterstützungstruppe. Für die Erneuerung des Fernmeldenetzes gibt es nun 115 Millionen Euro. "Es ist wichtig, dass wir einen Schritt voraus sind", so Doskozil. 115 Millionen Euro - und hunderte Wörter über die Häupl-Nachfolge, aber nichts zum FTCN.